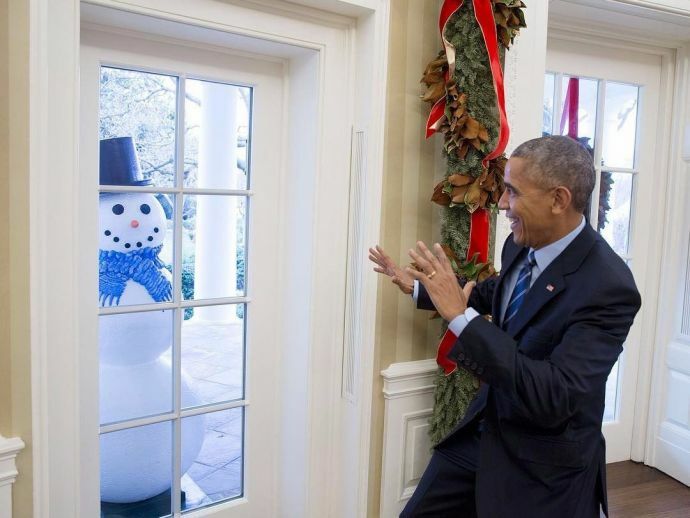 Snowmen And Christmas Freak Obama Out: White House Staff Trolls Its Beloved President! Did you know Barack Obama finds Christmas decorations “a little creepy”? It isn’t a state secret but yes a very few people are aware of the fact that the beloved American President Barack Obama finds Christmas decorations “a little creepy”. So, now that his tenure is almost done, his staffers at The White House tried to pull off a hilarious spoof on him. Pretty brave these guys, trying to prank on the single most powerful man in the world! The White House photographer, Pete Souza who is a pro at his work and has captured the leader in various ways before, struck a funny bone this time around, trolling the President hilariously. “We’ve been joking that we should move the snowmen a few feet closer to the Oval Office every day to see if anyone noticed,” he wrote on Instagram. He caught these moments on camera and sure gave Obama something to remember from his last Christmas at the office. Sometimes you gotta have fun. For the past three weeks, there have been four snowmen on display in the Rose Garden (see photo in earlier post). We've been joking that we should move the snowmen a few feet closer to the Oval Office every day to see if anyone noticed. Then we realized the snowmen were too heavy to easily lift. But finally this morning before the President came to the office, some helpful staff--I won't say who--moved all the snowmen so each one was peeking through a different window into the Oval. This photo was taken this afternoon as the President signed end-of-the-year bills. Another snowman from yesterday. Yes he enjoyed the prank. See previous post for the backstory. Obama: Has anyone seen Joe? Mr. President, don’t look now, but he’s doing it again. Obama: Joe, the disguise won’t work. We have to leave. The Twitteratti had a blast over this piece of news and you can see what they said! So it is pretty much Christmas now isn't it?